LOS ANGELES, California — Just around 24 hours after landing in Los Angeles, FC Barcelona held its first training session, a late afternoon workout at UCLA, since leaving Portland and arriving in California. It was also the team’s first pre-game workout of the 2018-19 season, and comes a day before Barça takes on Tottenham in the International Champions Cup at the Rose Bowl in Pasadena on Saturday night. After that, Barça will play two more friendlies on U.S. soil before heading back to Barcelona on August 4th. Prior to the session, Barça manager Ernesto Valverde and one of the team’s newest signings, Clément Lenglet, appeared at a joint press conference, also held on the UCLA campus. 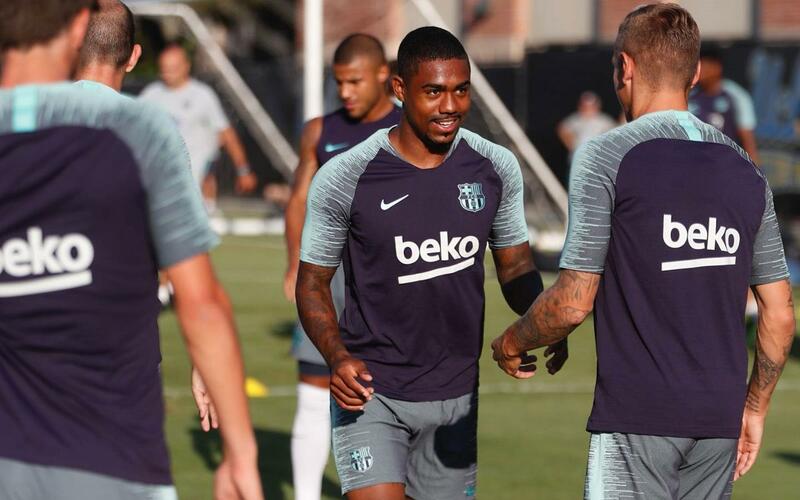 It was also the first time that Malcom, who signed on Wednesday at Nike World Headquarters in Beaverton, Oregon, trained in front of the cameras. Friday’s workout was open to the media for the first 15 minutes, which is a habitual occurrence for Barça’s pre-game sessions.